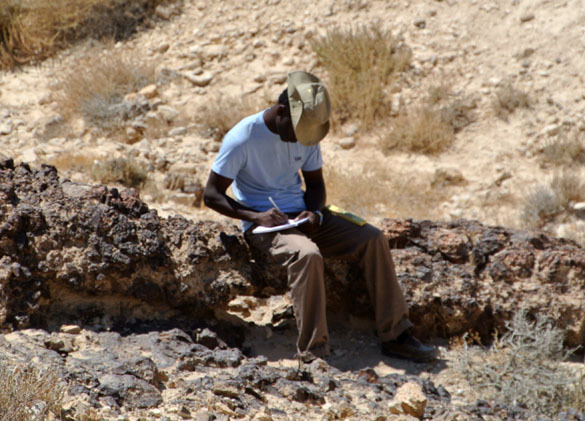 MITZPE RAMON, ISRAEL–Wooster Geologists Oscar Mmari’s Independent Study project on the Late Cretaceous phosphorites in the Negev has become multidimensional. His most interesting section is in Wadi Hawarim, where we returned today with Yoav Avni for additional observations and measurements. We are now doing a bit of structural geology that Dr. Shelley Judge would appreciate. 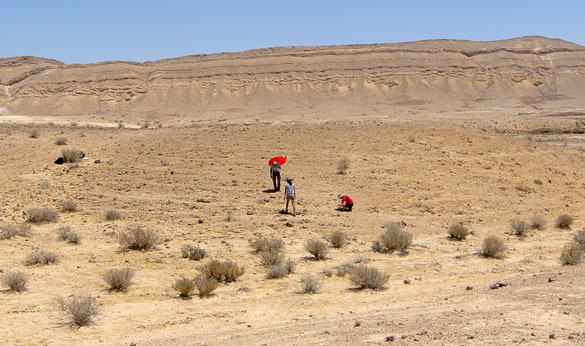 In this view above, the dark resistant unit on the left is the lower silicified portion of the Mishash Formation (Upper Cretaceous). Even though it looks like an igneous intrusion, these are sedimentary beds folded so that they are vertical in attitude. 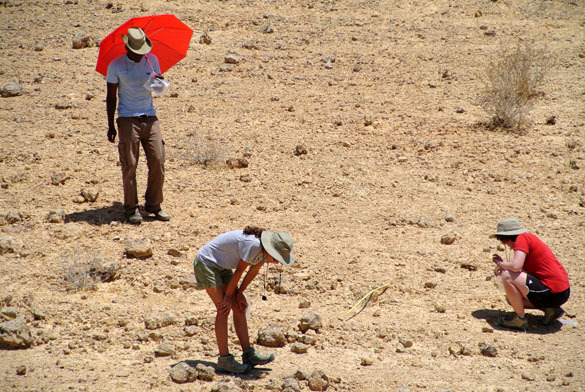 On the right you may be able to make out Oscar standing on Mishash beds that are almost horizontal. How does this make sense? What happened was faulting on the farthest left in this view above. A normal fault perpendicular to this screen has its upthrown block on the left and downthrown block on the right (where Oscar is standing). The Mishash silicified rocks are part of a drag fold as the blocks moved against each other. It appears that this faulting took place while the rest of the Mishash was still accumulating because debris from the silicified layers was spread over the phosphorites as they developed. There may also have been a shallowing of sealevel indicated by a layer colonized by shrimp who made Thalassinoides burrow systems that became inundated with siliciclastic sediment likely derived from the fault scarp. 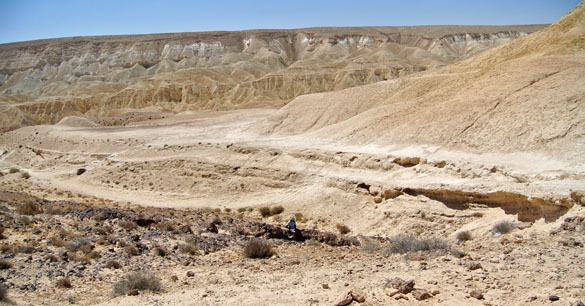 In this view into Wadi Havarim, the whitish phosphorite beds of the Mishash Formation are in the center above a dark conglomerate and below the yellowish Ghareb Formation. Oscar is sitting on Mishash conglomerate taking careful notes on this complex geological scenario. He’s going to need his skills in structural geology, sedimentology, stratigraphy and paleontology for this project!